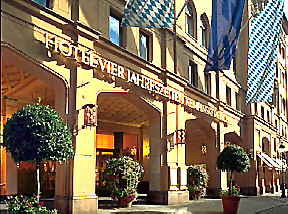 The Kempinski Hotel Vier Jahreszeiten Munich was built in 1858, but this beauty is timeless! In March 2005 Edward F. Nesta and I flew to a snowy Munich Airport, where Mr. Dennis Moser, of the Kempinski Hotel Vier Jahreszeiten Munich, Kempinski Hotel Vier Jahreszeiten Munich, met us and were driven to the hotel in their BMW limousine. We spent the next three glorious nights at the illustrious Kempinski Hotel Vier Jahreszeiten Munich, which was built in 1858, and we were surprised to see how timeless 147 years old can be! This grande dame of hotels is in a premiere location on the prestigious boulevard, Maximilianstrasse, where it is surrounded by a bevy of beauties in the forms of designer boutique shops, think Chanel, Cartier, Bvlgari, etc. to name but a few. If that is not enough to get your heart racing, it is located just a few blocks away from the altstadt, (old city), the Bavaria State Opera House and the English Garden. The hotel is more than just a charming beauty, it continues to host heads-of-state, royalty, celebrities, and selective guests who flock to the hotel for its excellent service, security, elegant style and discretion. The staff is professional yet welcoming, as we found out beginning with Mr. Moser, and continuing with the excellent assistance we received from Ms. Malvine Berthold, Guest Relations Manager, whose title could be “genie” as she was able to grant all of our many wishes. 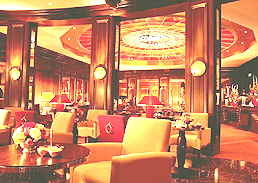 The hotel is elegant, yet has a comfortable feel to it, spectacular fresh floral arrangements grace the public areas of the hotel, there is a magnificent stained glass dome depicting the Four Seasons in the lobby and is also where guests can partake of Afternoon Tea or cocktails in the evening. In the afternoon, when the sun is shining through the stained glass, the room is bathed in a soft glow of orange light. The hotel has 316 total rooms, of which 50 are suites. We had the great delight of staying in one of the suites, which had a large entry foyer with a floor to ceiling mirror, and 2 umbrellas, to ensure that guests are prepared for rainy weather. A large living room was located to the left of the foyer, and an enormous bedroom was located to the right of the foyer. The spacious bedroom had a king bed sumptuously dressed in striped yellow fabric with orange pillows, 2 large windows, a bombe chest of drawers with a miniature palm tree in a creamy cache pot sitting on top of it, impressionist paintings, two comfortable yellow floral print chairs flanked a gleaming round wood table with a bouquet of my favorite orange roses, lemon leaves, baby’s breath and green chrysanthemums on it, and a triple temptation – 3 tiers of irresistible chocolates and petit fours, which of course, we had to eat, and enjoyed every last bite! Along one of the walls there was a large desk with an assortment of magazines, a telephone and Internet connection. In the many closets, there was a mini-bar, and safe large enough to hold a laptop or jewelry purchases from the luxurious shops on Maximilianstrasse. Of course, there was also a large television. The windowed large black and white marble bathroom featured double sinks, a large walk-in shower, a deep soaking tub, luxurious Bvlgari amenities, as well as a pitcher of bath milk sitting on the window shelf over the bathtub. The bathroom was fully outfitted with a make-up mirror, hairdryer, scale, stool, lush robes, slippers, fluffy towels and a bidet in addition to the lavatory. 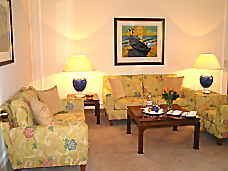 The comfortable living room had a large window the width of the room, 2 love seats upholstered in a yellow floral fabric that looked like Brunswig & Fils with yellow and orange striped pillows, a chair, ottoman, desk with Internet capacity, a large coffee-table book on the hotel, and more assorted magazines, impressionist paintings on the walls, and a large Anthurium plant in the corner of the room helped contribute to the homey ambience. The armoire discretely held another television, a Grundig stereo compact center, complete with turntable, cassette deck, and radio. 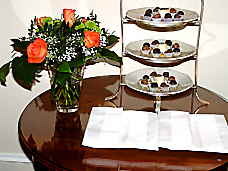 On the square coffee table, there was a beautiful spring floral arrangement of orange parrot tulips, bottles of Evian water, and a silver tray with an assortment of fresh fruit including my favorite fruit –gooseberries, as well as a box of decadent chocolates. Such a sweet welcome! Venturing out from our suite, we did see the hotel’s rooftop pool, sauna, fitness center with steam bath and solarium, but decided to forego indoor exercise and get our exercise in the form of walking and taking in the sights of Munich. I’m sure that carrying several shopping bags must count as exercise, doesn’t it? There is a beauty salon and shops located in the hotel, as well as a Business Center, which we did use, and found it a comfortable haven in which to work with ample desk space, computers, printers, and anything else that we might need. 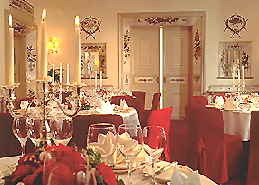 The BistroRestaurant is the hotel’s restaurant, which combines casual elegance with formal service, and features traditional, international and Bavarian cuisine. We had lovely lavish breakfasts each morning before exploring Munich and beyond, as well as an especially enjoyable lunch. Read our article on the BistroRestaurant in our Restaurants section and Bavarian recipes from Chef Michael Rieg in Chefs' Recipes . In the evening, we stopped to listen to the piano music in the English Bar over a glass of sparkling wine and found it to be the perfect way to start our evening, as well as the perfect ending, after returning for a nightcap after a night on the town. When it was time to return to the airport, once again Mr. Moser drove us to the airport. This time, it was bright and sunny, without a snowflake in the sky, which surely hinted that spring perhaps was finally on its way. Read our other articles on Germany in our Destinations, Hotels & Resorts, Restaurants, Awards, Music Scene, Chefs' Recipes and Gastronomy sections. You may also enjoy our previous article Destination - Berlin 2004. © June 2005. Luxury Experience www.luxuryexperience.com. All rights reserved.